Everyone is used to high-speed internet on their devices, surfing, streaming, and downloading gigabytes of data. Internet connection is nothing but the data transmitted to your devices wirelessly from the nearest cell phone towers, or maybe you have a cabled broadband connection. What if I tell you that instead of searching for either Wi-Fi spots, or maybe internet cafes around, you can access the internet using the light bulbs in your house? Yep, there is a developing technology named as Li-Fi, in which wireless internet connection with lightning fast speeds is provided to you using the light bulbs. 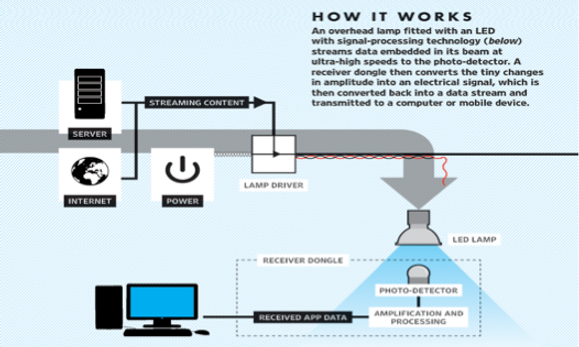 What is Li-Fi and who developed it? Li-Fi means Light Fidelity. It is an application of Visible Light Communication(VLC) in which wireless internet connection is provided using illumination, that is the light emitted out from the LEDs in the light bulb will operate on the pulses( 1’s and 0’s) which will provide connection to the device which detects the light. 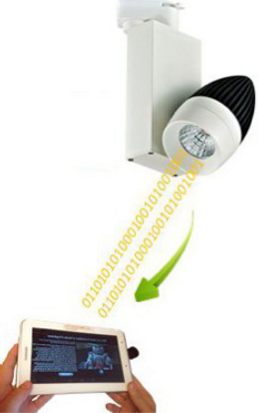 The light from the light source, probably in the visible light spectrum, will be detected by the devices nearby, and the camera of the devices acting as a receiver. Li-Fi technology was presented to the world at a TED talks’ conference in 2011 by Harald Haas working at University of Edinburg. He showcased the streaming of HD videos on a laptop device which used Li-Fi for the internet connection. The technology is still being developed by Haas’ team with the aim of developing a technology that will be more reliable, fast, secure and would replace the traditional radio-based communication system. Let us consider the modem of the internet as the uplink transmitter and the LED light bulb as downlink transmitter. The bulb will switch its states (ON – OFF) contemporary to the input of pulses 1’s and 0’s. If the LED is ON, you transmit the signal 1, and if the LED is OFF, you transmit the signal 0. The LED can switch states very quickly, so the data transmission speed is fast (and there won’t be any flicker). More the number of LEDs in a bulb, more the speed of data transmission. In China, by an experiment on Li-Fi, nearly 150 Mbps speed has been attained with 1 watt LED bulb while in Oxford and Cambridge universities, up to 3 Gbps speed has been reached. 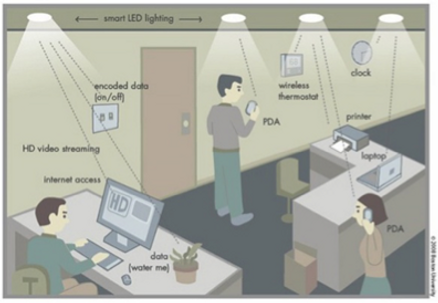 How efficient is Li-Fi? How can we implement? Wi-fi system uses Radio frequencies to operate connection wirelessly. Hence there is a lot of electronic disturbance by other appliances nearby which operate on other frequencies. 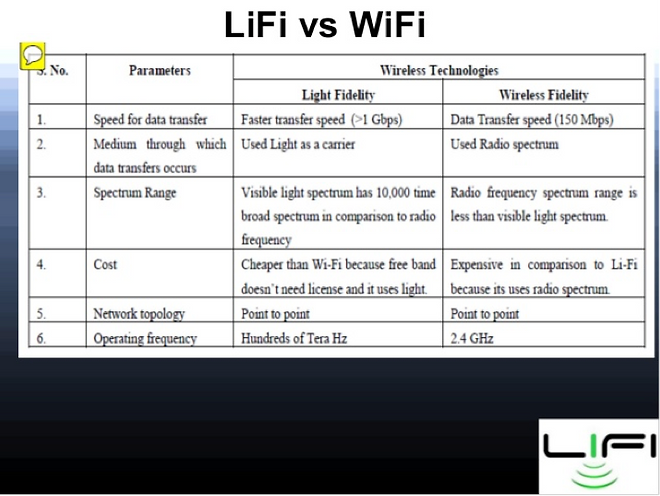 Also, the shortage of bandwidth when using Radio waves is overcome by Li-Fi. It uses visible light spectrum which offers more bandwidth than radio waves offer. Additionally, visible light frequencies are immune to electronic disturbances. Everything is hackable, even a Wi-Fi connection. This security breach is impossible when Li-Fi is considered. Also as light doesn’t pass through walls, the wireless connection is concentrated in a particular area where the light is concentrated. 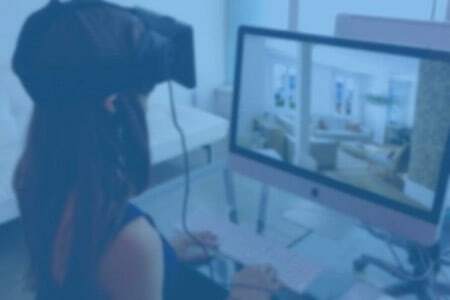 This property makes Lifi system deprived of security flaws. Wi-Fi and Bluetooth cannot pass underwater, but light can. 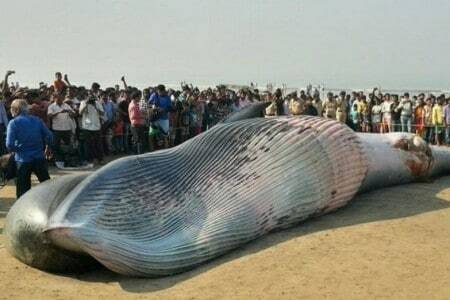 Hence for underwater applications like providing internet connection to a submarine, may be ships, etc. 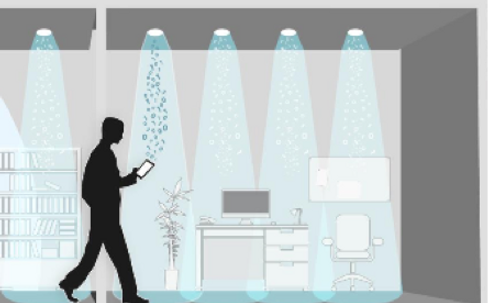 Lifi system proves to be efficient. The range of Wi-fi system is limited to few meters radius. To expand it we need additional routers and repeaters which add to the cost. To expand the connection of Lifi, we need just, LED bulbs. Owing to this technology of light, the street lamps which were just used to lighten up the roads, will now be used as the transmission points of high speed internet open to the public. In airplanes, the internet connectivity will be of visible light. Hence, it won’t interfere with other electronic parts of the airplane. Also, the speed to each passenger will be high and not affected by other passengers. This property is unlike Wi-Fi, in which the speed of one user is affected if there are more number of users signed up on the same network. This technology seems to be more efficient than the ones currently in use. It is more reliable, safe, fast and can be easily accessible shortly. 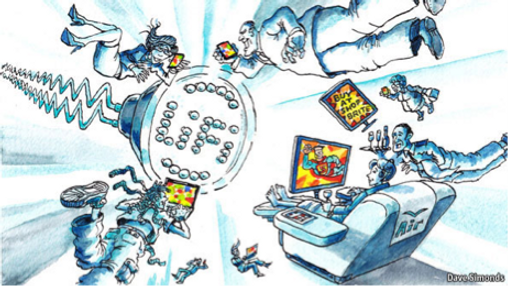 The shortcomings of the currently used systems can be overcome using Lifi. But man never stops developing and never will. There are few other technologies being developed like Gi-Fi (Gigabyte Fidelity), Wi-Fi max, etc. Each one of those technologies is in some way advantageous over the others. At this point, we can only speculate as to which technology is here to stay. Time will tell. 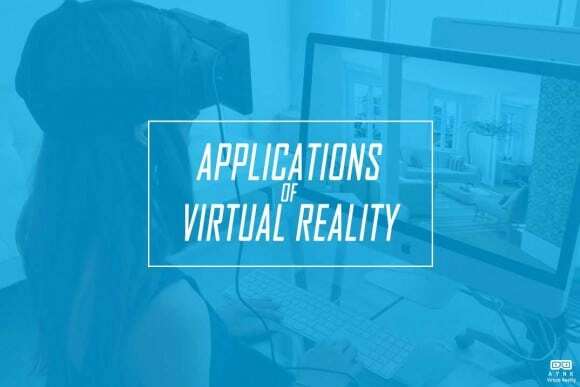 What are the possible applications of Virtual Reality? Binaural Beats – Get high without getting high! 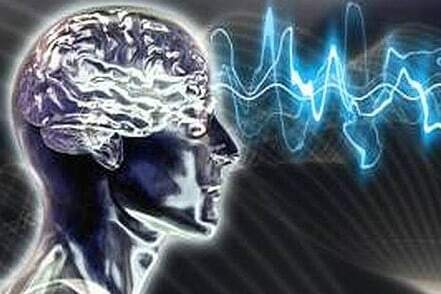 Binaural beats involve brainwave entertainment to soothe your mind & allow you to concentrate easily! Plug your headphones and chill!